Just Being Frank: Two, two, two posts in One! 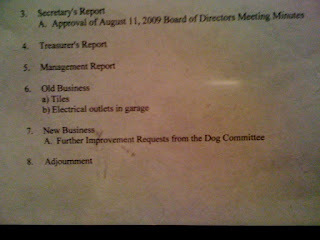 In case you can't read my fantastic photo it says, "Further improvement requests from the Dog Committee". To which, Punky turned to me and said, 'Gee, Mom, I'd sure like to be a member of The Groveland dog committee'. 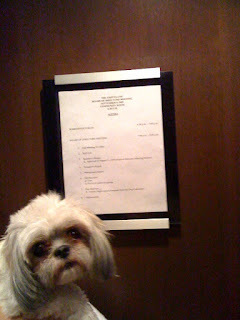 Maybe I should call the office and tell them Punky wants to join the 'Dog Committee'. See what Marge and Marty have to say. Second, I was recently honored to be chosen by a fellow blogger as one of her favorite blogs of brilliance! Who knew our dance lesson mishaps and blow up toys gone wrong were brilliant, but I'll take it! A. Choose 7 blogs that I find brilliant in content or design. 4. http://apartmenttherapy.com - Okay, so I'm a sucker for a lot of things. I also love anything home/decorating/cooking related. 6. http://www.mattlogelin.com/ - Matt's wife went to Blake and he is a phenomenal writer. The only writer who actually makes me cry. Sad, but wonderful. 7. http://heavytable.com/ - Again, I like to eat. And workout. And decorate. C. List at least 10 honest things about yourself. 1. I change my handwriting often. Whatever, its not that weird. I don't want to be detected by my hand writing! That's creepy! 3. I refuse to measure laundry soap, even though its the only thing my mom does measure. 4. I have 2 open table accounts so I can make multiple reservations at once. OHHH, I'M A REBEL! 5. I eat fiber one cereal out of small white ramekins. I eat pudding out of small green ramekins. I case the 4 previous items were not proof, I have strange habits. 6) I bake when I'm stressed. 7) British accents annoy me. Sorry, don't hate me British people who read my blog. All 0 of you. 8) I don't like key chains. I went through the key chain phase of 2000, when I had like 10 key chains. And didn't even have keys yet. And now I have 0 key chains. I know, I'm a fascinating person. You know you want to keep reading the next 2 things. 9) Apple juice and Salmon give me headaches. 10) I got in my first car accident at the Chaska KFC. I called my parents and said I was at KFC with my friend Sarah, and they assumed the Wayzata one, and I didn't say differently. They said that if there was no damage I should drive away quickly. So I did. #1. I wasn't in Wayzata, I was in Chaska. We just thought it would be fun to go for a drive. #2. Sorry man who drove a big rusted truck in Chaska in 1999. I didn't notice any damage. So there it is! 10 honest things! Since most of my friends don't blog...I think you should post your 10 honest things in the comment section. Or on Facebook. Please! I told you I don't wear clothes with food items on them. Now it's your turn! I personally enjoy #6. Also, my random things are on facebook. Who uses the word ramekins?